My role on the project is to research contemporary models of pilgrimage, and as such I will be conducting fieldwork at each of our four case study Cathedrals (Canterbury, Durham, Westminster and York). The information-gathering process involves participant observation, asking visitors to fill in questionnaires, and interviewing visitors and pilgrims as well as people who are part of the visitor services and pilgrim infrastructure. The first block of fieldwork took place at Canterbury in November 2014. It was a very useful and truly inspiring time and, most importantly, our team felt really welcome all through our stay. Key members of the Cathedral staff gave a great deal of time to help us. We are also very grateful to the many volunteers who were always there to assist, inform or talk to. Did you know that there are about 800 volunteers at the Cathedral? It is amazing how knowledgeable and dedicated they are. ‘What does pilgrimage mean to you?’ ‘Do you think pilgrimage still matters today?’ ‘Thinking back to your visit, what are your strongest memories of the Cathedral?’ These are some of the questions that we asked. Among other things, we are interested to find out more about the sensory experiences that people have when they go on pilgrimage and/or visit the Cathedral. 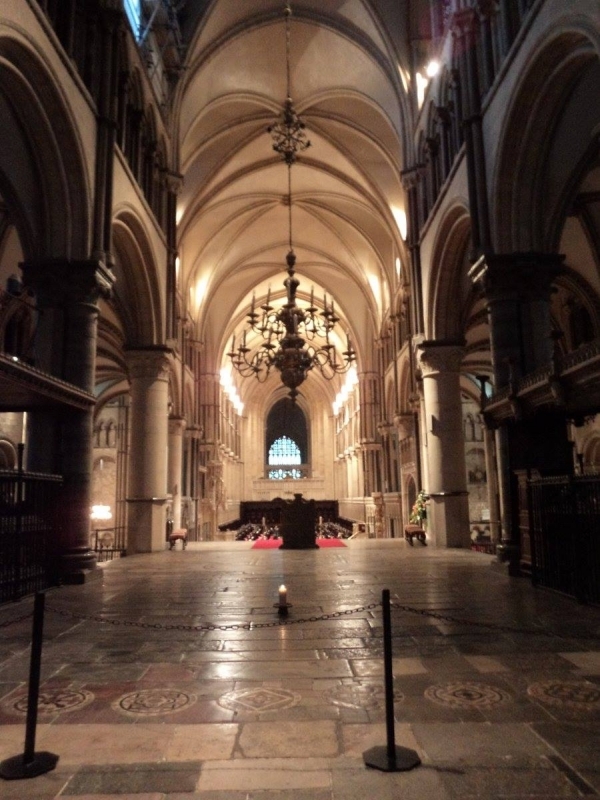 A number of the people I talked to at Canterbury felt that the Crypt is the 'powerhouse' of the Cathedral, and the fact that it is the only silent place there seems to make it very special and spiritual. For some people the strongest memory of the Cathedral was the view they had seen when first walking in.The first sight of a place of pilgrimage seems to be very important. From discussions with our historical researcher John Jenkins it appears that the feeling of awe that people have when entering the cathedral as well as when spotting it for the first time in the distance, remains as important today as it was for the medieval pilgrim. When comparing contemporary and medieval pilgrimage, some people said that one thing that could be the same is the companionship that develops on a spiritual journey, as it is something that they have experienced on their own pilgrimages. Pilgrimage seems to form an organic part of the life of Canterbury Cathedral. Many people are blessed on arriving (usually from Winchester) or departing for pilgrimage (mainly to Rome or Compostela). Canon Clare Edwards has set up a pilgrimage corner – a display with photos of the big pilgrimage event that took place at the end of October. Sometimes people are invited to the candlelit pilgrimage that Canon Clare gives inside the Cathedral. It would be interesting to find out what the metanarratives of our cathedrals are and how these may have changed over time. Do visitors perceive the metanarrative in the same way as Cathedrals present it? During the month that I spent doing fieldwork in Canterbury I met many people who shared with me their passion for the Cathedral. It turned out to be truly contagious.